The face is the first place the body stores fat when you gain weight. 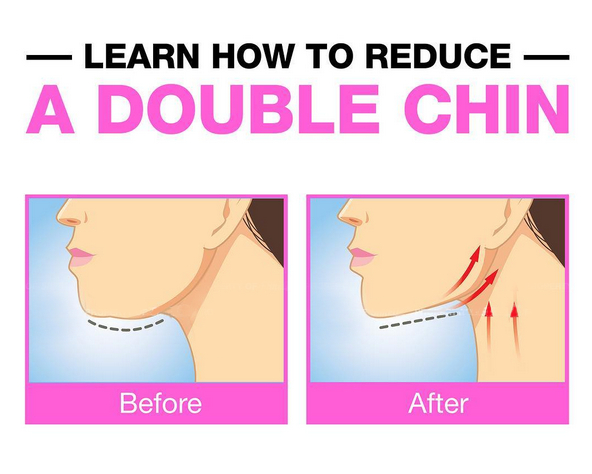 Double chins can be an embarrassing sign that you’re carrying a little too much body fat, but there are some exercises you can do that can tighten up your neck and help you reclaim your chin! You can incorporate these facial exercises throughout your day to help reduce fat and improve the look of your chin and jaw line. Posture plays a big role in how tight your neck and chin appear. If you slouch, you may be emphasizing your double chin. Instead, sit and stand with your back straight, as if an invisible string were holding your up from the top of your chest. Not only will this make the following chin exercises more effective, but it will improve your whole body function. Remember how in old movies, women used to slap the bottoms of their chins? Well, it turns out there was good reason for that! Using the back of your hand, gently slap the double chin area of your neck. Sounds crazy, but if it worked for them, it’ll work for you. Standing or sitting with good posture, stretch your head from your chest all the way back until you are looking straight up. This will stretch the platysma muscles of the neck. Hold for ten seconds and return to a normal position. Repeat this exercise daily until you can do ten or more comfortably. For the Lip Pull, you’re going to push your jaw out and lift your lower lip up as much as possible. Pretend you are trying to touch your lower lip to your nose. This is going to flex the muscles along your jaw line. You should really feel this one! Repeat 10 times a day. I know, I know. Its rude, but sticking out your tongue as far as you can engages lots of muscles in the face and neck. Stick out your tongue as far as possible and hold for ten seconds. Try it ten times in a row. Stand or sit with good posture and stretch your neck back until you are looking straight up. Open and close your mouth slowly. You’ll feel the muscles of your neck and jaw flexing and stretching. Repeat ten times daily.